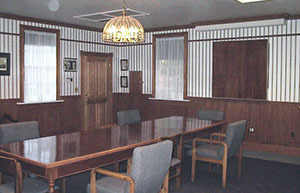 The Boardroom is a unique facility that is decorated in an 1899 motif. 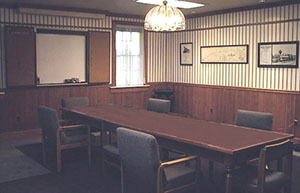 It is able to host a small group or meeting. The room is 21′x23′ with a capacity of 30 people. A large table (3′x12′) suitable for seating up to 12 people. Closable Whiteboard (4′x4′) with cork board on the inside of doors for hanging flip charts when doors are open. A telephone can be supplied.